Fake news has become a larger topic of conversation. Where and how we get our news has greatly expanded and it has become even more fragmented. There are more sites promoting fake news with claims that are not backed up with evidence. There are also fake news sites that are legitimate that are available for parody like the onion. When looking at news you have to treat it as if you are trying to evaluate information for research. You have to ask yourself the questions about who is reporting the story, what are the basis of the claims, and use the criteria for evaluating information to see if the news story presented is true. It is a good idea to look at all news organizations more critically, at the stories they present, and the people who are presenting the news. On this page you will find information and stories about fake news and how to critically look at information and postings on social media. 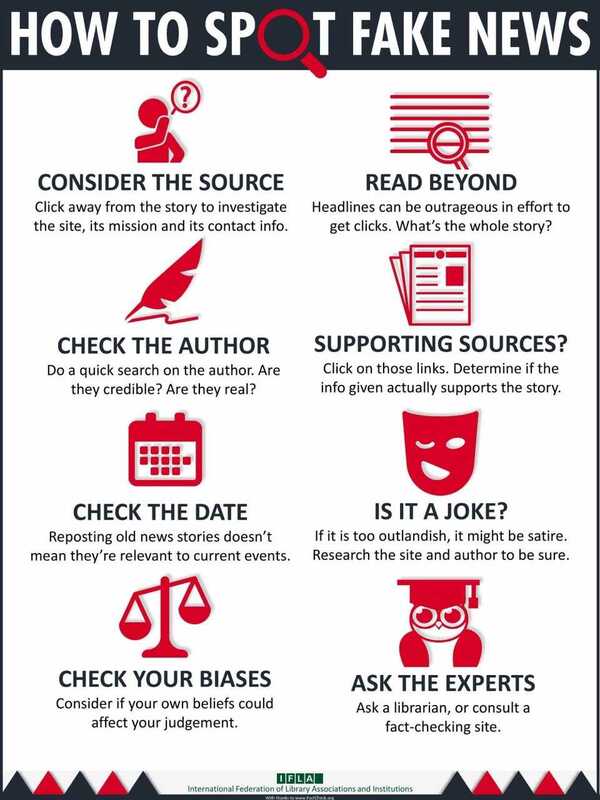 Here are some ways to avoid fake news and below are links on how you can avoid fake news. Use the criteria for evaluating information: Accuracy, Authority, Objective, Currency, and Coverage. Look at the domain name and the URL: News organizations typically own their own domain name. Check the credentials of the author. Check the links of the article: See if the information leads to credible sources. Look at the date and see when it was written. Look at the comments that are listed below the story. Open a second window and research the claims that are written in the story. Check your own biases: Sometimes we tend to look at information in the prism of our own beliefs. Information and facts about information literacy. How to avoid fake news articles. Take the fake news quiz. How to avoid getting conned by fake news sites. Education systems in a post-truth world. 'Frondeurs' and fake news: how misinformation ruled in 17th-century France. An Extremely Helpful List of Fake and Misleading News Sites to Watch Out For. Snopes' Field Guide to Fake News Sites and Hoax Purveyors. Lesson in the Library on How to Spot Fake News. Avoid These Fake News Sites at All Costs. Social Media has grown in use and is now a source of information and news for people. The video talks about how social media does not give you much information when using it for research. Like all media it is important to evaluate the claims that are discussed about social media. Listed below are links that discuss social media and the news and information presented on their sites. 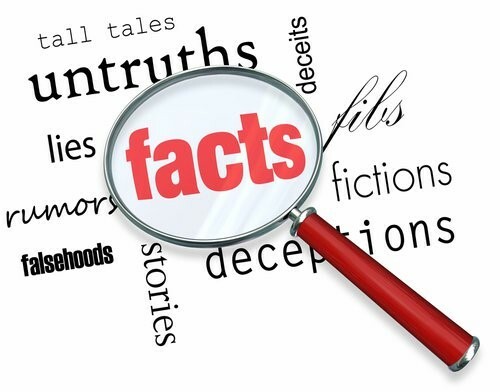 ABA Legal Fact Check, the American Bar Association will use case and statutory law and other legal precedents to separate legal fact from fiction. AllSides is made up of folks from every side of the aisle and in between. MBFC News is dedicated to educating the public on media bias and deceptive news practices. It is an independent online media outlet. The snopes.com is one of the best online resources that debunks Urban Legends and Rumors on a huge number of topics. ABCnews.com.co is a fake news site designed to look like the real ABCnews.com. The site presents news that is not real real or based on confirmed facts. The is the real logo for ABC News which owns its own domain and owned by the Walt Disney Company. Nationalreport.net is a fake news site that has a disclaimer that states that it is fake news. The site, despite the disclaimer has been sighted as a source for information and the disclaimer is not seen on the front page of the website.